In my office I have a plaque that Kenny Williams gave me when I decided to leave Joint Forces and move on to work with DISA. I see this almost every day, sometimes I am facing it for hours. What does it mean? What does it mean to you? As I have stated in earlier posts, Ken for me is a personal living hero. He is a man of honor and integrity, he is a man of purpose, and he is a true leader. Most people talk about “the warfighter” and don’t know anything about war or service for that matter. Ken doesn’t just talk about people in the field, he actively works to help them. This year as shown in his dispatches from the field, he chose to go out and help them in person. To me it is no different from a firefighter or a police officer or anyone else who serves our community and makes sacrifices for the GREATER GOOD of our country and our way of life. It is a volunteer military but what would this country do if people didn’t volunteer? These people are making a choice and a sacrifice. In some cases they make the ultimate sacrifice. I am responding to those of you who can’t deal with what Ken has been writing and to those of you that have told me that it is by choice that our service members are serving. You are RIGHT! It was their choice, and their choice made it so that you or your children or grand children aren’t sitting in a festering pit wondering what war they are fighting and why. The common saying by service members is “I would rather fight the enemy on their land as opposed to ours.” The young men and women of our country are doing us a service and they deserve not only our respect but they deserve our support and our attention. It is my personal responsibility as an American and as a person who recognizes that people are putting themselves in danger for ME and my family to do everything I can to recognize them and support them. I am sharing my plaque with you. I can’t write a blog every week saying the same thing as you will either stop reading or ignore me. This is reality. What I can do is share with you this reminder, copy the picture, print it do what you want but know that this plaque is for all of us. This is what it really says to you. You may not be a Marine, but the Marines love you. They would give and have given everything to protect you and our way of life. You don’t have to be there with them to help. You can be where you are and lead/follow from where you are to help them. 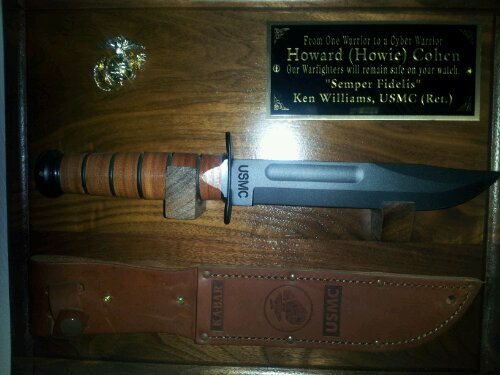 Although this plaque says “Semper Fidelis” the blade this plaque holds is not bound to one service . Take a moment at some point everyday to remember that good people are working for and fighting for you today. Find ways to stand up for them and protect them and remember them, think about them because they are certainly thinking of you. There are American troops in everywhere, if you are serving them in some way as a government employee or contractor don’t fail them. Don’t make excuses either, excuses don’t stop bullets. If you are a citizen, please take some time to think of them. If you are service member, Thank You.